Posted January 3rd, 2016 by AdminGURU & filed under Google, Mobile Friendly Website Design, Responsive Website Design, SEO, SEO Friendly Website Design, SEO Website Design. THE VIEW FROM THE SEO AGENCY LEVEL – 2015 had a lot of changes and updates to the way our SEO Agency works. For the most part, many of the same rules apply, but now there is more focus on MOBILE. 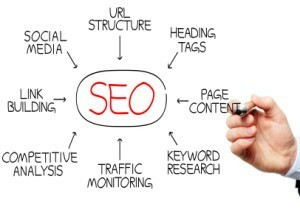 SEO Agencies need to stay on top of the latest updates. Remember Mobilgedon? April 21st 2015 was the first time Google pre announced a major algorithm update. Google’s April 21st update had web designers and developers scrambling to update many outdated websites to better serve mobile visitors. Links are still around, but natural growth is favored over artificial inflation of links to the website. Relevant website industry and genre’s still provide value. A new focus on authoritative sites is providing many new potential revenue streams for publishers and large curated website publishers that focus on quality and unique content. Local Search has received more attention and with that we should start seeing new features and functions pushed to visitors by the major search engines. A phenomenal article from MOZ.com showcases the current ranking factors. I am embedding a snapshot of this page below since the URL that is being used is updated. (It will be interesting to look back on in a few years). From year to year, the only thing you can count on in local search results is change. – SEO Agency. Last year’s survey corresponded almost simultaneously with the Pigeon algorithm update. We’re now one year in, and although no significant algorithmic changes have been reported since Pigeon, the Local Stack / Snack Pack results were fully rolled-out worldwide just prior to this year’s edition. Given that context, I asked respondents this year not only to rate ranking factors across pack and localized organic results, as in previous years, but also the specfic factors to which they were paying more (and less) attention to since the release of this interface. As with last year’s survey, the individual factors listed in the results are consolidated to just the top 50 in each category. As in recent years, the 2015 edition of this survey was divided into four parts. In this section, I asked participants to identify the influence of eight thematic clusters of ranking factors across the two primary types of Local results (localized organic, pack). In each case, they assigned a percentage of influence to all eight thematic clusters, totaling 100%. Businesses consistently ranked behind their competition in each of these types of results can use this section to prioritize their marketing efforts by theme. In part A of this section, I asked the experts to rank the top 20 individual ranking factors (out of a total list of 114) that have the biggest impact on pack/carousel rankings. In part B of this section, I asked them to rank the top 20 factors from the same list, only this time to rank them based on impact on localized organic rankings. In part C of this section, I asked them to rank the top 20 factors from the same list based on biggest impact in a competitive market, across both result types (pack and localized organic). Here, I asked the experts to rank the five factors they were paying more attention to since the introduction of the Local Stack, and the five factors they were paying less attention to since that introduction. In this section, I asked the experts to rank 27 negative factors in order of most damaging to most benign.